Terminal part of the leg enabling upright stance and walking. The skeleton of the foot is made up of 26 bones. First phalange of the toe; it is joined to the metatarsus. Short bone of the tarsus that, with the calcaneus, ensures rotation of the ankle and, with the tibia and fibula, flexion and extension of the foot. Bone of the posterior row of the tarsus forming the protuberance of the heel and supporting a large portion of the body’s weight; the Achilles tendon is attached to it. Bone of the anterior row of the tarsus articulating especially with the metatarsal bones of the two last toes. Bone of the anterior row of the tarsus articulating especially with the metatarsal bone of the third toe. Long bone forming the outer portion of the leg; it is connected especially to the bones of the tarsus to form the ankle joint. Long bone forming the inner portion of the leg; it is connected especially to the tarsus to form the ankle joint. All seven short articulated bones, laid out in two rows, making up the heel and the ankle; it connects the tibia and the fibula to the metatarsus. All five long bones that make up the sole of the foot; it connects the anterior row of the tarsus to the proximal phalanges. Articulated bones forming the skeleton of the toes. Each toe has three, while the big toe has only two. Last phalange of the toe bearing a nail. Each of the five bones forming the metatarsus. 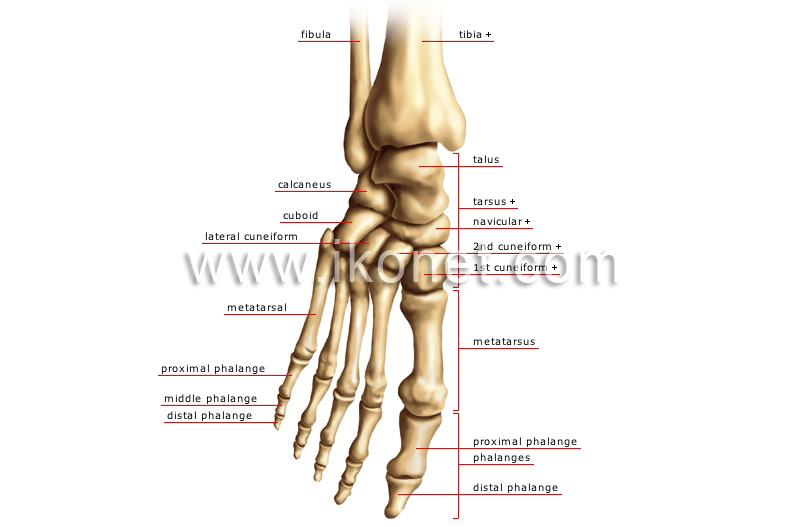 Second phalange of the toe between the proximal and distal phalanges. The big toe does not have a middle phalange.